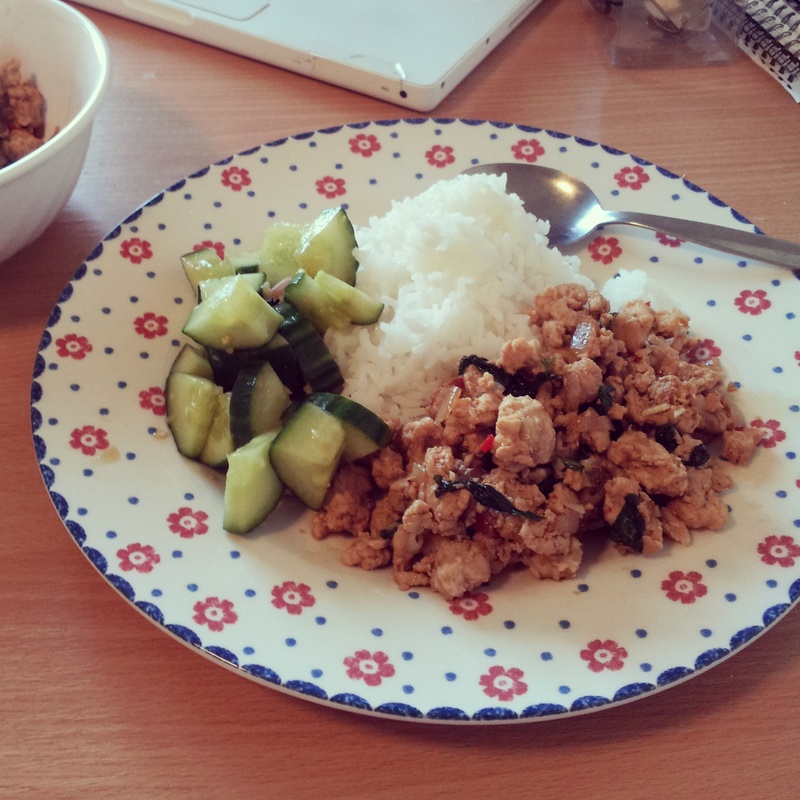 The inspiration for this Thai-style Basil and Chilli with Turkey Mince came from a dinner I enjoyed at a Thai restaurant in Oxford two weeks ago with WS and his friends to celebrate WS handing in his thesis (hurray!). One of our friends ordered the chicken with basil dish to share, and when it arrived, I took one look at it and without tasting it, knew I had to re-create it at home. I made this with turkey mince instead, which worked well and was probably a little healthier, too. 1. Heat wok on medium heat. When wok hot, add oil. 2. The oil needs to be hot for stir-frying. You’ll know that it is hot when it glides around very smoothly around the wok and starts to shimmer just slightly. 3. Stir-fry garlic and shallots until fragrant, but do not brown them, adjust heat to low-medium if necessary. 4. Add chilli. Stir fry for a minute. Do not let it brown. 5. Add turkey. I stir the meat constantly, and I use the spatula to split up the meat so that it separates into lots of tiny pieces. 6. When turkey is starting to get some colour, and when the meat mixture is starting to lose moisture, add fish sauce, basil, and dark soy sauce. The dark soy sauce is not very authentically Thai, but I like adding it to give the dish a little more colour and sweetness. 7. Continue stir-frying until meat is cooked through. Serve hot. Because of the chilli’s heat and dryness of this dish, I served it with a Cantonese-style cucumber salad. There was a post on a cucumber dish before, but I’ve since been eating the below version, which I prefer more. For the cucumber salad: mince 4 small cloves of garlic and add to a food storage container with a lid. Add 1 tablespoon of light soy sauce, 1/2 tablespoon of rice wine vinegar, and 2 teaspoons sesame oil to the same container, mix well with the garlic. Dice 1 cucumber by first quartering the cucumber length wise (to do this – chop off the ends of the cucumber to flatten them, then very carefully stand the cucumber vertically, slice it down in half, then in half again making an ‘X’). You’ll be left with 4 long lengths of cucumber. Hold these lengths together than chop them across, which will create perfect quarter-circles of cucumbers. Add to the garlic and mixture, mix well, refrigerate until serving time.